1 of 1 Heat broiler. Coat a broiler pan with nonstick cooking spray. 1 of 1 In a bowl, stir mayonnaise, ketchup, relish and onion. Cover and refrigerate. 1 of 3 In a large bowl, stir turkey, zucchini, bread crumbs, egg whites, garlic salt and black pepper. Form into eight patties, about 3 ounces each and 4 inches in diameter. Place on the prepared broiler pan and broil for 4 minutes. Turn over and broil for an additional 3 to 4 minutes until nicely browned and cooked through. 2 of 3 Split rolls and place on a baking sheet. Toast lightly, about 30 seconds. 3 of 3 Place split rolls on work surface. Spread a generous tablespoon of sauce on both sides of each roll. Place a burger patty on each of the four roll bottoms. 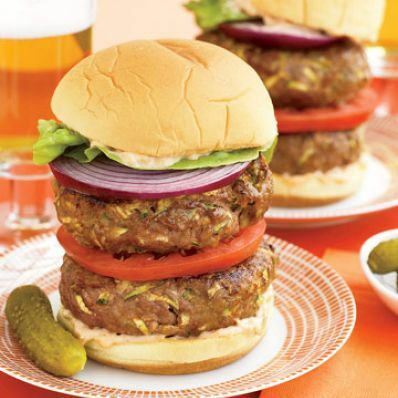 Layer each with a tomato slice, a second patty, onion slice and leaf of lettuce. Place roll tops on burgers and serve.